How do I subscribe to a calendar from Stackfield? The export of the calendar is based on the iCal protocol, which is basically a news feed, which can be subscribed by various calendar tools. Will encrypted events / tasks be exported, too? Yes, encrypted events / tasks will also be exported, but they will be displayed without the title, because that information is encrypted on our servers and we are not able to decrypt it. For this reason, all that is shown in the calendar is that an encrypted appointment or task is happening at a specific date. Therefore, no relevant data are disclosed through the export. How do I export the calendar on Stackfield? 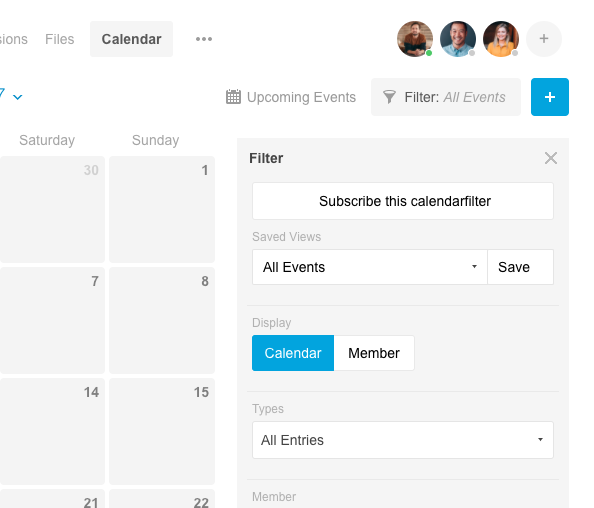 The export of a calendar can be done by clicking on "Subscribe to this calendar view" in the upper right corner of the calendar module or the global calendar, after having opened the filter options. Please note that always the currently selected view is exported, so you may have to change or edit the view before exporting the desired tasks or events. You will need to activate the calendar feed for that calendar in order to display an individual link, which will be used for the import in your preferred calendar tool. 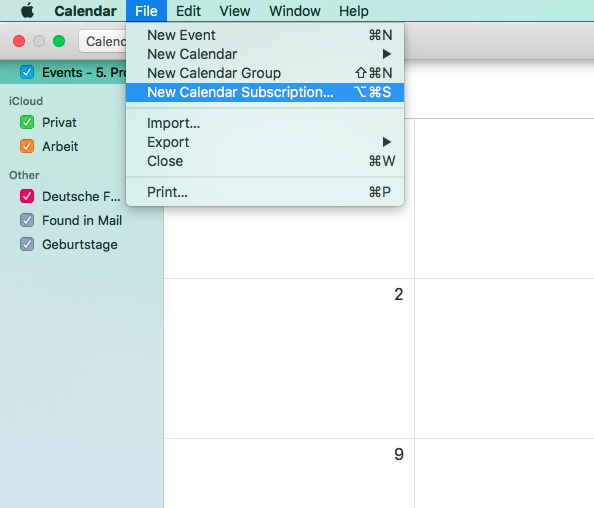 You can import the Stackfield-calendar to iCal (since version 10.10 called "Calendar") by selecting "File" --> "New Calendar Subscription". Then you simply need to enter the link from Stackfield into the text input field and to confirm the process by clicking on "Subscribe". Subsequently, you are able to specify a name (helpful if you subscribe to multiple calendars), to choose a color, and to define after how many minutes your import will be updated. In order to always be up to date, we recomment to choose "Every 5 minutes". 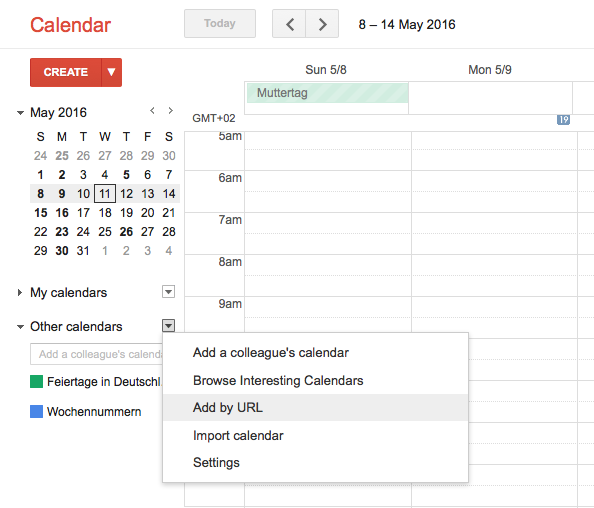 Open the web app of Google Calendar and click on the arrow-icon at "Other calendars" in order to open the dropdown menu. 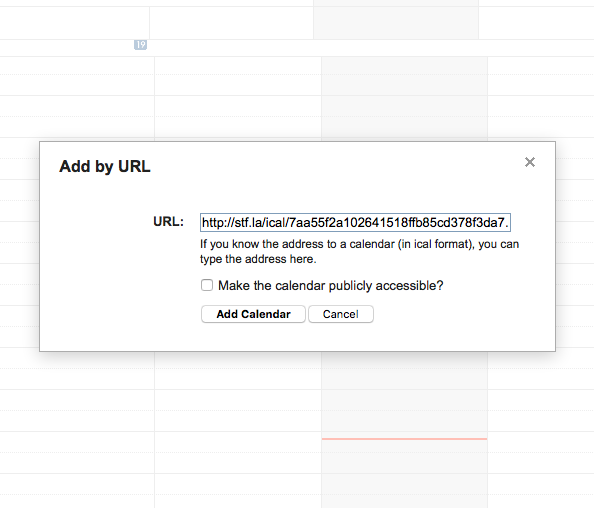 Choose the option "Add by URL", and enter the calendar-URL from Stackfield. Then confirm the subscription by clicking on "Add Calendar". Unlike to iCal, you are not able to adjust how often the calendar is updated. Instead, the calendar will not be updated for at least 8 hours, which is why changes of events / tasks are not directly visible in Google Calendar. In the desktop version of Outllok, an internet calendar can be subscribed by clicking on "Open Calendar" and selecting "From the internet". 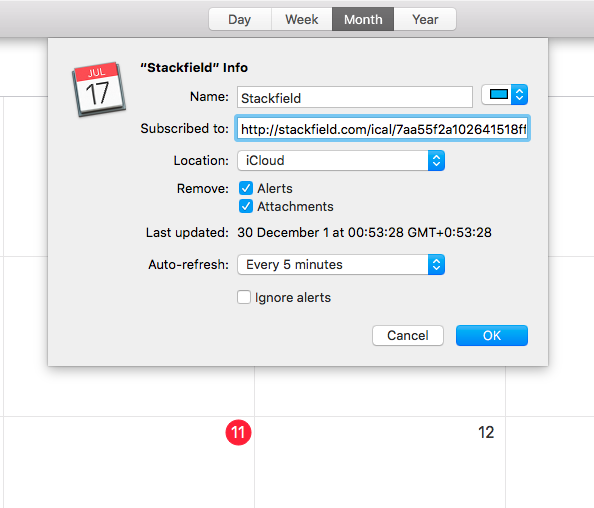 Afterwards you are able to enter the calendar-URL from Stackfield. 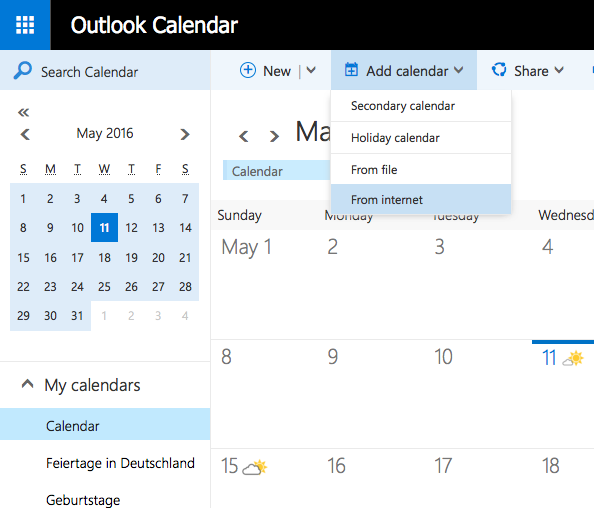 Open the page Outlook.com and switch to the calendar by using the icon / button in the upper right corner. Then use the feature "Add calendar" and choose "From the internet". 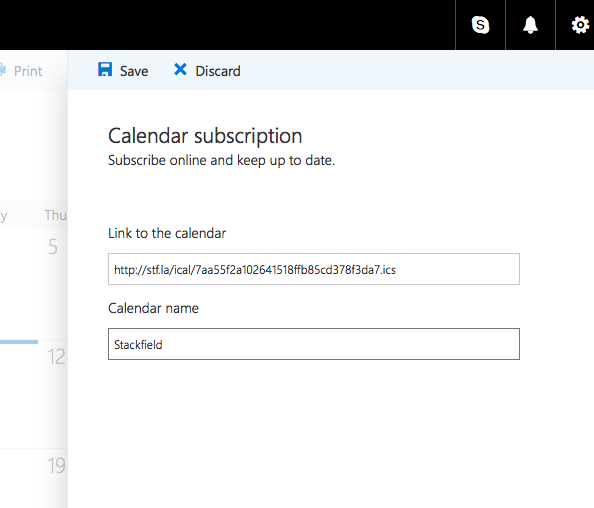 Now you are able to enter the calendar-URL from Stackfield. You can also define a specific name for the calendar import. Click on "Save" above the text input fields to confirm the subscription.